Open to working with the government on other projects too. 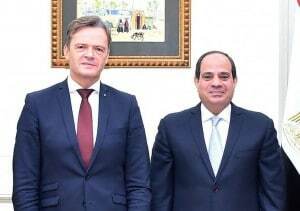 Markus Schäfer, Member of the Divisional Board of Management of Mercedes-Benz Cars, Production and Supply Chain, and the President of the Arab Republi c of Egypt H.E. Abdel Fattah El-Sisi spoke about plans to start a new assembly plant in Egypt. Mercedes-Benz Cars is considering construction of a new assembly plant in Egypt. “Egypt is an attractive and competitive location for production and supporting logistics,” said Markus Schaefer, the executive responsible for Mercedes-Benz Cars, Production. Schaefer said local assembly enables Mercedes-Benz to expand its market position. “Furthermore, with our broad-based product portfolio, our electric initiative as well as our expertise in respect of modern mobility concepts, we are ready to support the Egyptian authorities in related projects,” said Schaefer, adding Mercedes is studying market and sales potential. The “framework conditions” in all markets and regions are constantly surveyed by the automaker and the market strategy is aligned accordingly, he added. The passenger car assembly plant in would be built by a local business partner, Schaefer said. The planned localization effort is being developed in close collaboration with the Egyptian government and was further concretized in recent successful discussions with representatives of Egypt in Germany. “We welcome the decision of Mercedes-Benz to resume manufacturing and assembly of cars in Egypt, a step that reflects the improvement of the investment environment and the performance of business in Egypt, in the light of the implementation of the comprehensive economic reform program as well as the openness of Egypt to cooperate with the German company within the framework of its policies to develop the automotive industry in its various categories,” said the President of the Arab Republic of Egypt H.E. Abdel Fattah El-Sisi. There have been talks on important state infrastructure projects with the Egyptian government. With regard to the new capital in Egypt and the planned new “smart cities,” Daimler has offered its expertise in modern mobility concepts, electro-mobility and electric cars as well as autonomous driving, he added. However, the detailed agreements have not yet been concluded between the Egyptian government and Daimler AG. Daimler currently operates in Egypt an own import and sales organization a central spare parts warehouse as well as retailers and workshops in Cairo, Giza, Alexandria and Hurghada. Mercedes-Benz Egypt S.A.E. – a wholly owned subsidiary of Daimler AG – is the exclusive distributor of Mercedes-Benz passenger cars and spare parts in Egypt operating since 1999. This entry was posted on Thursday, January 24th, 2019 at and is filed under Automakers, Business, Daimler, Executives, Markets, Mercedes, Personalities, Politicians. You can follow any responses to this entry through the RSS 2.0 feed. Both comments and pings are currently closed.